The writer follows the journey of her immigrant ancestors from their earliest beginnings in our great nation to their travels to the small coal mining camp of Minden nestled in the mountains of West Virginia. The story continues with the struggles of a coal mining family, the close-knit relationships with family and neighbors, and growing up as a coal camp kid. Life is difficult and poor in money but rich in what truly is important to the family---the love and heart-warming treasures that remain in their hearts. What happened to Aunt Elsie? Was her death an accident, suicide, or murder? 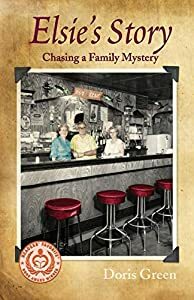 Haunted by her aunt's death in a northern Wisconsin tavern, Doris Green seeks answers. 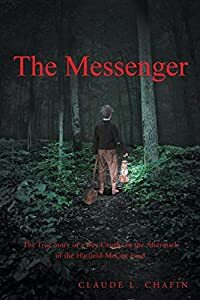 She embarks on a decades-long search using a combination of journalistic inquiry, family history research, and even hypnosis and other alternative ways of knowing. The quest leads to secrets, surprises, and, finally, a solution. When former slave, Islay Walden returned to Southwestern Randolph County, North Carolina in 1879, after graduating from the New Brunswick Theological Seminary, as an ordained minister and missionary of the American Missionary Association, he moved in with his sister and her family in a secluded area in the Uwharrie Mountains, not far from the Lassiter Mill community along the Uwharrie River. Walden was sent to start a church and school for the African American community. When the church and school were begun this was, not surprisingly, a largely illiterate community of primarily Hill family members. The Hill family in this mountain community was so large, it was known as "Hill Town." The nearby Lassiter Mill community was larger and more diverse, but only marginally more literate. Walden and his wife accomplished much before his untimely death in 1884, including acquiring a US Postal Office for the community and a new name - Strieby. Despite Walden's death, the church and school continued into the 20th century when it was finally absorbed by the public school system, but not before impacting strongly the literacy and educational achievements of this remote community.From Hill Town to Strieby is Williams' second book and picks up where her first book about her ancestor Miles Lassiter, an early African American Quaker [Miles Lassiter (circa 1777-1850) an Early African American Quaker from Lassiter Mill, Randolph County, North Carolina: My Research Journey to Home], left off. 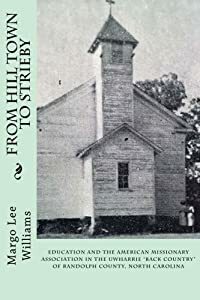 In From Hill Town to Strieby, she provides extensive research documentation on the Reconstruction-era community of Hill Town, that would become known as Strieby, and the American Missionary Association affiliated church and school that would serve both Hill Town and Lassiter Mill. She analyzes both communities' educational improvements by comparing census records, World War I Draft record signatures and reports of grade levels completed in the 1940 census. 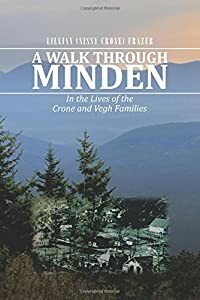 She provides well-documented four generation genealogical reports of the two principal founding families, the Hills and Lassiters, which include both the families they married into and the families that moved away to other communities around the country. 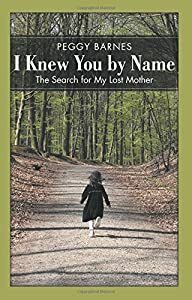 She provides information on the family relationships of those buried in the cemetery and adds an important research contribution by listing the names gleaned from death certificates of those buried in the cemetery, but who have no cemetery markers. She concludes with information about the designation of the Strieby Church, School, and Cemetery property as a Randolph County Cultural Heritage Site. 416 pp. 146 illustrations. Peggy Barnes' recently unsealed birth certificate arrived just after she buried the woman who raised her. She discovered her entire life had been a lie. She was born at The Salvation Army Home for Unwed Mothers to a young woman from the back hills of Alabama--Miss Pauline Miller. Peggy says: "I'd always been told my birth parents were dead. At age sixty-five, the last thing I needed was another mother. But I wanted to find Pauline. If I could find out what happened to her, maybe I could answer some of the questions I had never understood about my own cracked-up life." During her long search, Peggy obtains diaries, letters and photographs that reveal Pauline's heartbreaking story. Peggy discovers much of her mother's life echoes her own. Here are their stories of: abandonment, addiction, estranged fathers, a truly evil stepmother, the churches that kicked them out and the churches that offered salvation. Chronicling their similar lives gives Peggy the courage to reveal her own hidden truths. Pauline's letters, written so long ago, teach Peggy to finally forgive herself. Deeply moving, yet laced with wit and humor, this is a daughter's love story to her mother. Ric Murphy's award-winning book, "Freedom Road: An American Family Saga from Jamestown to World War" is an historic account of the oldest recorded African American family, and their participation and rich contributions to American history over a four hundred year period. It is a compilation of well-documented individual stories that begins in Africa in 1483, and from there, spans over fifteen generations and three continents, and definitively changes our understanding of American history, showcasing the significant role that one African American family has played from colonial American history to present day. Freedom Road is an exciting and compelling American saga that captivates readers with the story of the enslavement of John Gowen, one of the first Africans brought to America, and the first to be set free; the story of Thomas and Rebecca Cornell, forced to leave England because of their religious beliefs, and how they became known as the family of Presidents; and the story of the daring escape of Othello and Thomas Fraction from their cruel, vindictive slave master, himself the brother of a Confederate Senator and the son of a Virginia governor. 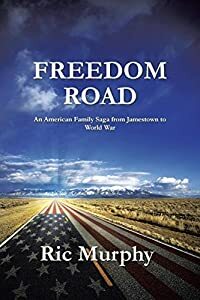 Freedom Road is enthralling, resounding, and evocative; it challenges the reader to have a better understanding of American history, and inspires them to learn about their own family history. If you like history, family sagas or intrigue, Freedom Road is a must read. In 1892, at the age of six, Andrew Lee Chafin went to live with Anderson “Devil Anse” Hatfield in order to attend school. His life would never be the same. The Hatfield-McCoy feud had been over for four years, but that didn't stop bounty hunters and state officials from trying to hunt down Devil Anse's sons, Cap and Johnse, to punish them for the roles they played during the course of the fighting. From the age of nine, Andrew Chafin-author Claude Chafin's grandfather-served as the link between the elder Hatfield and his sons. Despite the danger, he delivered food and messages back and forth through the rugged mountains on horseback. He encountered bears, wildcats, and bounty hunters, but he never wavered in seeking to carry out his mission. Until now, his story-that of a remarkable young man-has gone untold. Join Claude Chafin as he traces his family's history and explores the critical role his grandfather played in the history of the famous feuding clans.